When I logged into wordpress tonight I saw this post from Mike on Running Around the Bend and I thought what a perfect way to sum up my year of running. The original idea for the post came from a challenge hosted by Amanda at Miss Zippy, a new to me blog, but one that I’m very interested in exploring further. I ended 2013 on a high with a handful of PRs. I entered 2014 with a couple of very lofty goals: run a sub-2 hour half marathon and complete an ultra-marathon. I did one, but not the other. The winter was brutal here in New England, but I braved the frigid temperatures and trained for the Vermont City Marathon. I’ve had more downs than ups this year, and as a result I will enter 2015 a very different runner. Best race experience? 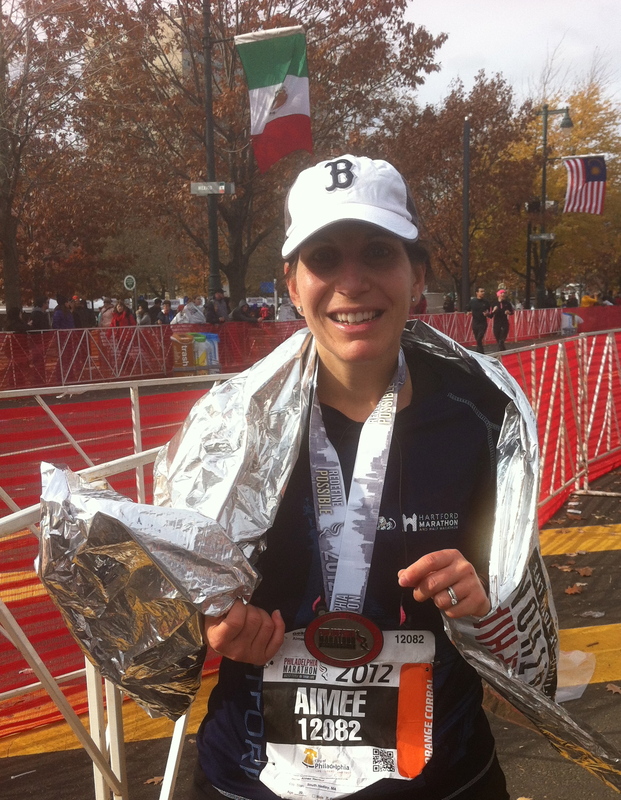 My personal best race experience of 2014 was the Harvard Pilgrim Half Marathon on 4/6/14. With a time of 1:58:30,I accomplished my sub-2 hour half marathon goal on the first try! Running a sub-2 hour half seemed like an untouchable goal for me for so long. As I ended 2013 after a year of getting increasingly faster I knew the goal was within reach, but I expected it to take me all year to accomplish. This race will stand out as the pinnacle of my running accomplishments for 2014 because it was mostly all downhill from there. Perhaps my favorite face of 2014 and maybe of all time, was the Baystate Half Marathon. It was my second and last half marathon of 2014. I ran it on 10/19/14 with my friend, Kate. It was her first half marathon. We trained together and ran it together, side by side. I can’t explain the feeling of pride I felt when we crossed that finish line. She did such an amazing job and it was awesome to share that moment with her. Running a 3 hour training run with Kate. It was actually meant to be our two and a half hour run, but we had to detour and it added time onto our run so we kept going for another 12 or so minutes to reach our long run goal of 3 hours. It was a challenging run with lots of rolling hills, narrow street with no sidewalks and significant traffic and cold rainy weather, but we did it! It was a solid training run and I knew without a doubt after that run that Kate was going to accomplish her time goal at the Baystate Half Marathon. 14 mile marathon training run in 8 degree weather on the ridiculously hilly streets in my town. It was so cold my ponytail froze. I couldn’t feel my face, hands or feet for hours. On 4/24/14, I set out for what was to be one of my last long training runs before the Memorial Day weekend Vermont City Marathon. I dropped Carlos off at my sister’s near Boston and I began a 22 mile run along a new to me bike trail. My left foot didn’t feel quite right, but I went anyway. * I had been looking forward to running along a new to me running route on such a gorgeous day. About 4 miles into the run I stopped in pain. I knew at that moment the run was over. I, stubbornly, hobbled the 4 miles back to my sister’s condo crying most of the way. And just like that I was done. It would be literally months before I would run again. I found out later that I had severely injured my Achilles, no tear though. This run changed everything for me. It is this run that has made me a different runner today. I don’t remember exactly when it happened, but the first pain free hour long run after my Achilles injury was a very happy moment. I remember running at the reservoir on a beautiful sunny day. I didn’t wear my Garmin or use Map My Run. I just ran with a great big smile on my face. 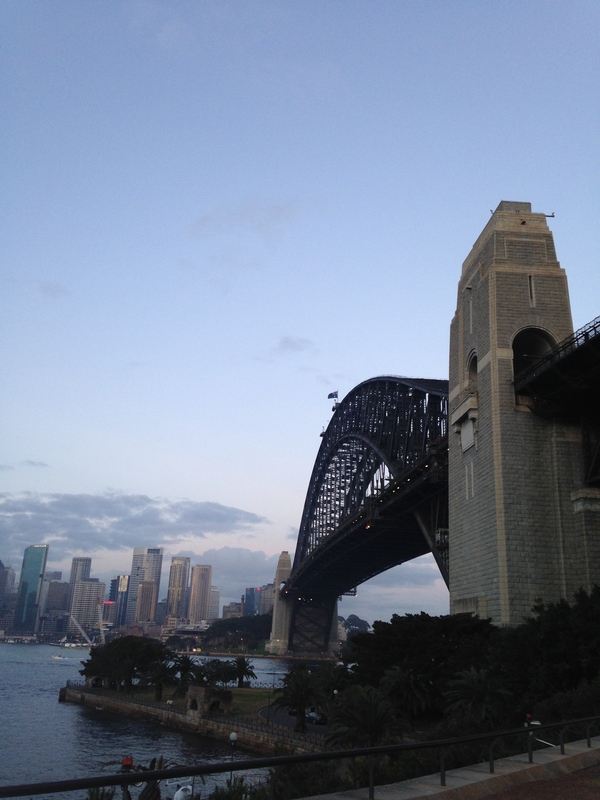 I set out for an early morning run in Sydney and naturally made my way down to the harbor. 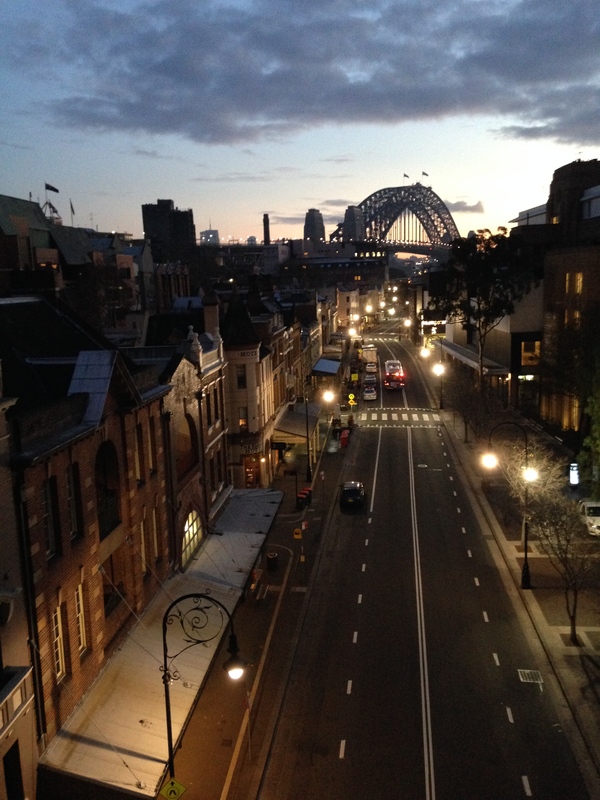 It was beautiful and quiet at this time of day. 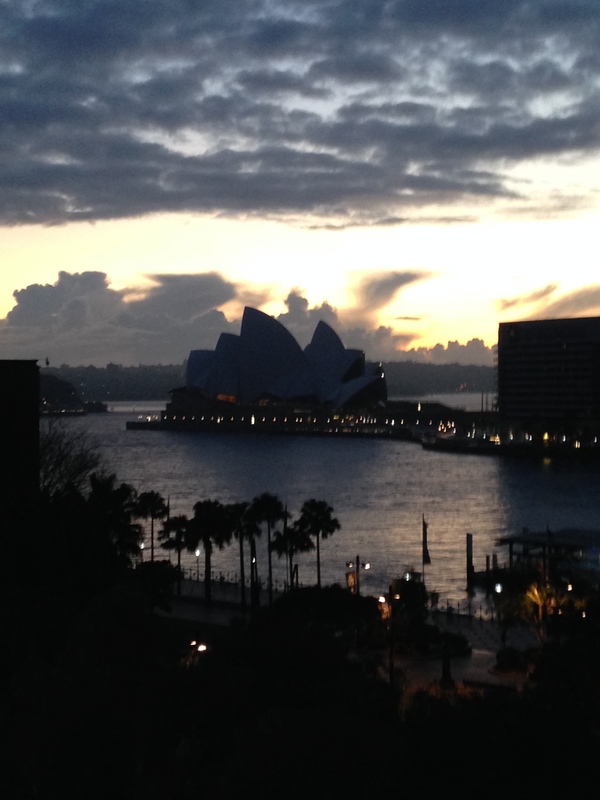 Overlooking the Rocks section of Sydney at dawn. 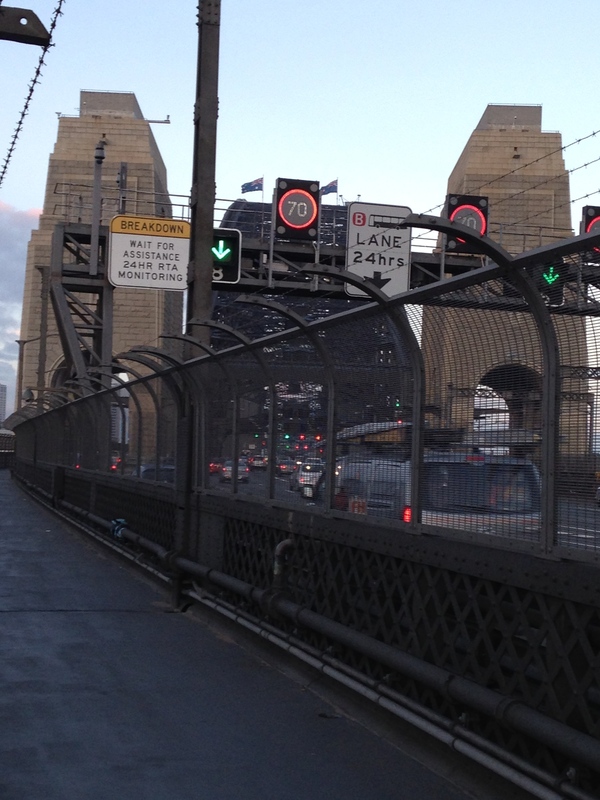 A view from the Sydney Harbor bridge as I began my run over it. 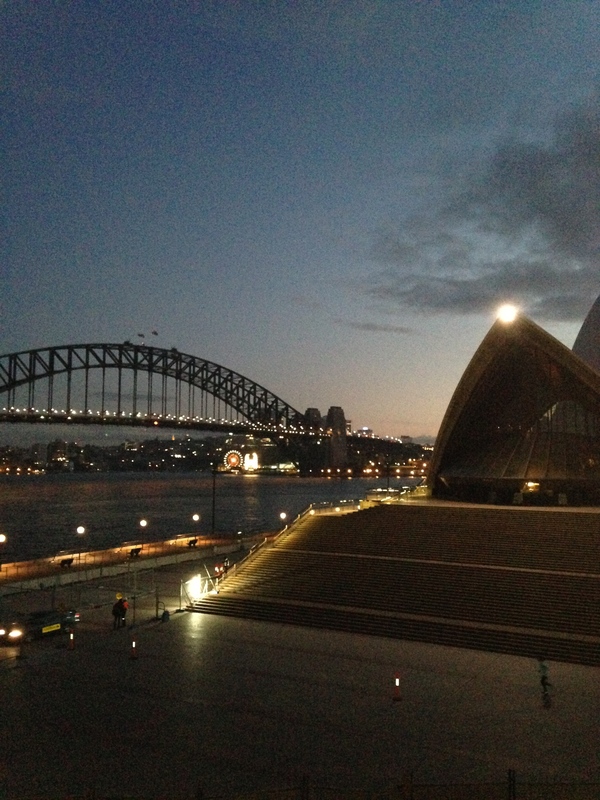 As I made my way back over the bridge the sun began to rise and I was in awe of the Opera House from this vantage point. 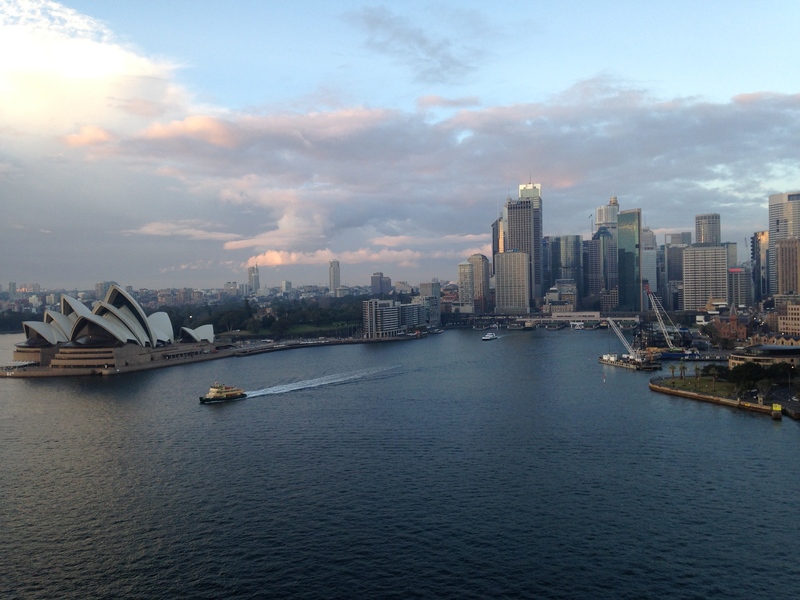 Sydney Harbor is a bustling place all day long and it’s activity starts early in the morning. OK back to the original questions. New Balance W1010 Minimus Running Shoe – I haven’t run more than 10 minutes in them, but I am excited to learn how to run in a minimal shoe. I like the feel of them. I have dreams of trail running in these shoes. Sparkly Chicabands – I’ve tried so many headbands to keep my hair out of my face while running. Every single one prior to the Chicabands has found its its way off my head at some point during a run, but not these. They really do stay put and who doesn’t love silver sparkles?! After all of those interventions the pain actually got worse and radiated up through my calf. I was sent home from PT on 5/30/14. The physical therapist advised me to call my primary care doctor. I actually drove straight there and arranged an appointment that day. The doctor gave me the most important advice, “Be patient and give it time to heal.” Ironically that night I tried something I hadn’t before, heat. Within hours the pain dissipated from a 9 to a 4 out of 10. After more rounds of my heating pad the pain in my calf was completely gone and my heel pain was down to a 5. From there on in I began getting better every day, but I decided running was going to wait until I felt like it was the right time and there was no perceptible discomfort. It was a wise decision based on simple but sage advice. If you feel discomfort don’t run! And if you feel pain definitely don’t run. I could have possibly saved myself a lot of time away from running, aggravation and money. Well, of course there’s the story of Meb Keflezighi and his glorious victory at this year’s Boston Marathon making him the first American male to win it since 1983. Sure it brought tears to my eyes, but really the most inspirational runners are the ones I see everyday. These are the people that make me want to run. They run in all kinds of weather and at all hours of the day whenever they can fit it into their busy schedules. They are moms, dads, students, young, old, in shape and out of shape. They are not running to win a prize, they are running for their health both mental and physical. If you could sum up your year in running in a few words what would they be? I started this blog as a place to document my running journey after running my first half marathon back in 2010. It’s fallen to the wayside recently as has running. This year has been busy in a way I can’t quite explain. I honestly don’t know where the time has gone, but not only have I not had time to write, I haven’t even had time to read my favorite blogs. I miss both. Not much running is happening either. I miss that more than anything. While these things have taken a back seat there have also been exciting new opportunities this year. As I shift into a very new routine and way of life I’m hoping to return to running and writing about it. You had some awesome high points this year to be sure, though I know it was tough in parts as well. I had a 6 month injury period myself several years ago, and had a similar experience with coming back to it and looking at things differently. And I’m 100% with you on real world life taking over and leaving not enough time in the day for all I want to read online. Enjoy the rest of December, the holidays, and all the goodness that comes with this time of year! Just stopping by to send hugs and thank you for the beautiful note you sent to me. It still seems so surreal that Tony isn’t here anymore – I literally was in the kitchen Sunday when I had my tablet on the counter and saw that they made the announcement for the new Apprentice Show (a reality t.v. guilty pleasure of ours!) and started to shout “babe, guess who’s going to be on the new Trump show? !” before I stopped myself and realized I was alone. Hugs! Oh, so sorry that you had a major Achilles injury – those are no fun at all!!! Love the pictures you shared. Aimee…I loved your recap. You had some amazing runs…and learned a lot while you were injured. 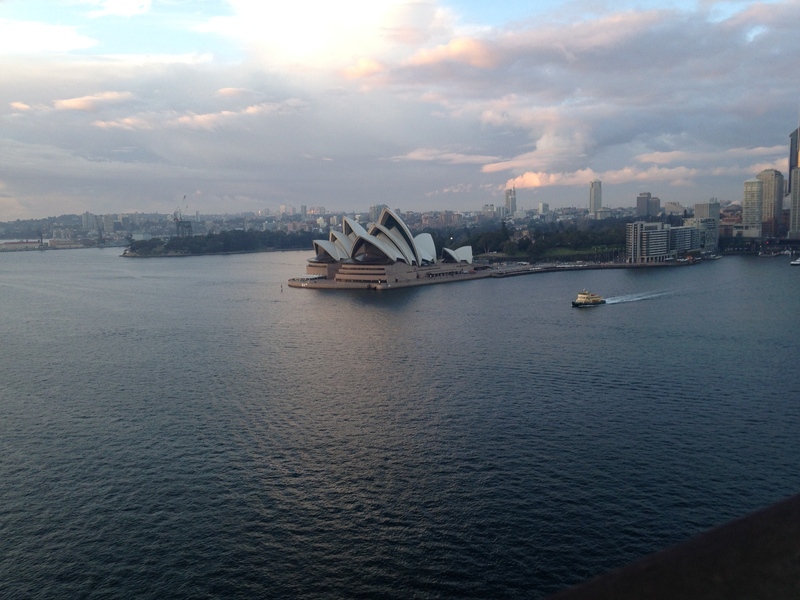 I’m hoping that 2015 will bring you happiness with running again!